Members of the South Okanagan Health Care Auxiliary have reason to be proud after the province approved their name to be linked with the outpatient lab and two patient rooms in Penticton Regional Hospital’s new tower. Patients who visit the outpatient lab when the new tower at Penticton Regional Hospital opens in 2019 will notice a strong South Okanagan connection. The South Okanagan Health Care Auxiliary has received government approval for its name to be featured on the outpatient lab’s main blood sample collection area as well as two patient isolation rooms. The Health Care Auxiliary has already contributed $200,000 towards its $250,000 pledge to the South Okanagan Similkameen Medical Foundation to help provide medical equipment for the PRH expansion. The Auxiliary, which dates back to the 1940s, has been able to make this generous donation largely due to public support of its thrift shop in downtown Oliver. President Carol Howes noted they have also donated to various other facilities including South Okanagan General Hospital (SOGH), plus McKinney Place extended care and Sunnybank Centre long-term care in Oliver. The Oliver Thrift Shop opened in 1942, operating under different names and locations over the years. “Our shop does very well and we truly appreciate the community’s generous donations and support,” Howes said. Other fundraisers include their “Dinners at Home” frozen meals program and a “baby showcase” at SOGH. 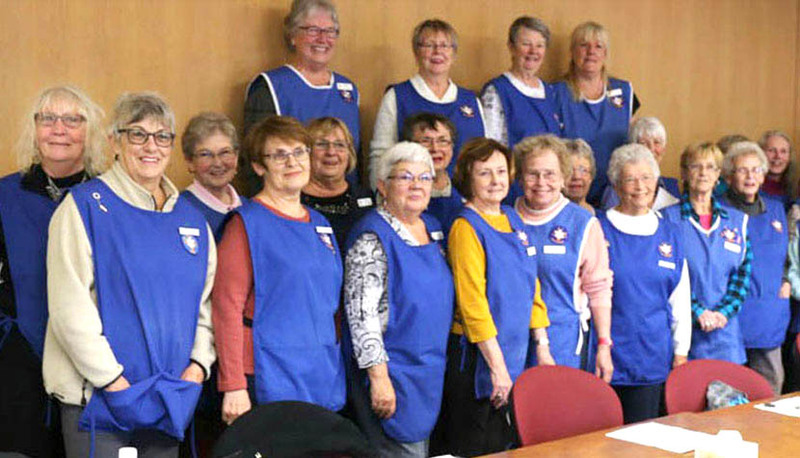 The auxiliary contributes a further $10,000 annually towards a cancer patient transportation service operated by the Masonic Lodge, which picks up people in Osoyoos and Oliver undergoing cancer treatment in Penticton and Kelowna. It also provides annual bursaries to graduating Osoyoos and Oliver high school students planning to enter a human healthcare profession. Prospective volunteers can pick up an application form at the Thrift Shop on Kootenay Street which is open Wednesday through Saturday. Penticton Regional Hospital is the acute care hospital for more than 90,000 residents throughout the South Okanagan-Similkameen. Construction of the new six-storey patient care tower is about half-way towards its April 2019 completion date. Work then begins on Phase 2 of the hospital expansion, including a major upgrade of the Emergency Department. The SOS Medical Foundation has now raised $15 million in donations and pledges towards its $20-million PRH campaign goal.